Thick photonic crystals can be used to cloak the lines on a surface. The Romulans are tricky so and so’s, running around cloaked — at least they have to de-cloak to fire (The Romulans are a Star Trek species that use a cloaking device). It turns out the British Army has got a similar idea, and has demonstrated that it can hide a tank using cameras and screens. At Photonics West in January, I saw a presentation that showed the cloaking of lines on a surface using a thick photonic crystal – very intriguing. It’s not actually a tank or spacecraft , but it is a real feasibility demo. Joachim Fischer at Karlsruhe Institute of Technology in Germany described how to create a thick 10-20 period deep photonic crystal with variations in the pattern that created refractive index variations that directly offset the underlying feature. 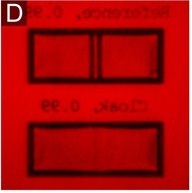 The figure below, shows the variations in the layer and the comparison showing the hiding of two underling lines – the reality of cloaking. To a patterning guy, just as impressive is the way in which these were made. The patterns are created using 2 photon lithography, a very clever way of patterning in 3D . To expose a resist that is sensitive to 400 nm radiation with very intense 800 nm radiation, two photons must be absorbed simultaneously to create the photochemical reaction. Now if the exposing light passes through a microscope, there is enough intensity at the focus, to pattern a point in a thick layer of resist. If the resist lump is scanned around in three dimensions, an arbitrary shape can be formed. This idea has been around for a while, and Nanoscribe make a 3D lithography system. The current system is limited by the imaging resolution of 800-nm light. The group in Karlsruhe added a hollow sphere using 520-nm radiation around the focus, that turned off the edges of the 2-photon exposure creating a much smaller exposing spot. Now they could create the 3D varying photonic crystal that acts as the cloak to visible wavelengths. The only drawback is that this is a scanning spot technique. Just like every other serial scanning system, such as electron beam lithography, 3D scanning is slow. In another presentation, a group from Cambridge showed that they could create self aligned 100-period-deep uniform photonic crystals by combining flow and bending. These films created deep colored layers that changed color as they were stretched. At previous Photonics West conferences , some uniform structures have been made using multi-beam interferometry. The long term challenge is how to create non-uniform thick arrays in parallel, without scanning. Maybe a combination of creating a regular array and then writing in the defects is an option. All in all, it was an intriguing window into the underlying physics of the Romulans. There is also a good discussion on cloaking in Wikipedia.